Erth Minerals Honey Veil (medium) is ultra-fine and silky in texture. Honey Veil is identical to Erth Minerals Moth Veil with just a pinch of color. Honey Veil helps diminish the look of pores, helps seal in makeup and keeps shine at bay. Perfect product for concealing pores and giving your face a softer, more even, and less shiny look. Can be used alone, or over foundations and concealers. Best applied with highlighting brush after the rest of your mineral makeup has been applied. Available in Moth Veil (light), Honey Veil (medium), and Autumn Veil (deep). 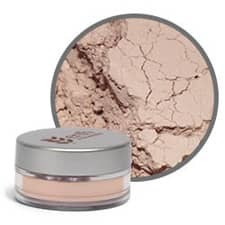 The true beauty of mineral powders is that they fulfill four distinct purposes in helping you create a flawless face- it helps to reduce shine, keep foundation on longer, add additional light coverage, and help diminish pore size. Erth Minerals veil is best applied with a foundation brush and in layers, used sparingly. If you have oily skin, you can apply a fair amount of veil to your face which will obviously also help reduce shine. However, if you have dryer skin, it is usually best to apply mineral veil sparingly and only to the nose and forehead areas.